VINTAGE FOGHAT 1981 Touring America Concert T- Shirt Size Lg Ticket Stub. I bought this t-shirt at the FogHat concert at the Cape Cod Coliseum on August 1, 1981. The shirt and stub have been in storage for years and are in great shape. There is a small discolored spot on the front of the shirt near the left cuff of the sleeve in the picture. It is very faint and hare to notice. Comes from smoke and pet free home. Shipped with USPS First Class to USA only.Please ask questions before bidding. Motley Crue Shout At The Devil Tour 1983-84 100% Authentic OG Jersey Shirt. Shipped with USPS First Class Package. I purchased the shirt personally at a concert. There is a black stain on the back of one sleeve. Also there are some tiny tiny holes from wearing it while I was welding. Those holes don't typically get any bigger. Even if you wash it many times. The label is “Surf N Sand”. This is a Shaheen’s label and fabric. Cotton material. Shoulder to Shoulder: 18”. Outer Sleeve Length (shoulder edge to cuff edge): 9”. Top to Bottom Length (from collar fold): 29 1/4”. Shirt is in Good condition for it's age. It does have a hole in the right arm pit that needs to be repaired. Good condition otherwise. See pictutres as they show exact condition. SHORT SLEEVE! ATOMIC PATTERN. SHORT SLEEVE. A GREAT LOOKING SHIRT! NO MATERIAL LABEL, I THINK IT IS RAYON OR ACETATE. SIZE: X-LARGE, ARMPIT TO ARMPIT 26". Super cool color block two tone. 23 pit to pit. hard to find. Good condition. Shows general wear and big hole on back left sleeve - see photo. Back yoke and back edge of collar have been re-stitched. Silky rayon material. Has top neck loop, one chest pocket, and original buttons. THIS IS A GREAT CLASSIC PENDLETON IN SUPERB SHAPE. NO HOLES, STAINS, OR TEARS THAT I CAN DETECT. A BEAUTIFUL SHIRT IN XL. HARD TO FIND IN SUCH GOOD SHAPE. WESTERN YOKE - FRONT AND BACK. BROWN GRAY SHADOW PLAID. USA 14.5 32. 1960s 'H BAR C RANCHWEAR' WESTERN SHIRT! A GREAT LOOKING SHIRT! TWO CHEST POCKETS. MADE IN USA. SNAP-UP FRONT. NICE SHAPE. true vtg GANT YALE CO-OP shirt, size 15.5, short sleeve prep ivy trad classic! (No stains. There are only two flaws. 1) The 2nd button from the top is missing. These are pretty common buttons so, it should be an easy fix. But I did). Those who love this stuff know how rare this thing is. Width is Pit to Pit, Length is Top of Back Collar to Bottom of Shirt. Length: 27 ”. Inner Sleeve Length: 23". Width: 23". Has a patch on the arm. Belonged to a Shriner who was part of their Clown Unit. Funny to see this sort of bowling shirt style embroidery put on a pearl snap. very Texas-y! Pre owned, shows general wear. Jacket - 22” pit to pit, 24” sleeves, 18.5” shoulders, & 29.5” from base of neck to rear hem. Trousers - 19” across the waist w/2” to let out, 15.5” front rise, 17” back rise, 31” inseam, 42” outseam, 1.6” cuff w/.75” inside, and 9.5” across the cuff. Please take a look at the rest of my auctions for similar golden age styles in similar sizes! Glad to combine shipping. Not accepting best offers, just whatever the end result is of free market competition. Thanks for looking! New ListingOSHKOSH VINTAGE ENGINEER STRIPED BIB OVERALLS MENS 56/32 UNION MADE USA NICE ! These overalls have been worn and laundered once or twice. 2 large hip pockets. All pics are of the same ONE jacket/robe. See all pics for details & enlarge each pic for a closer look. Pic 12 shows what may be considered a flaw in the fabric. To me (my opinion) it is from the manufacturing process of the fabric. THE BEAUTY GOODS OF FIRST RATE QUALITY M This fabric is NOT stretchy. Please see measurements above as vintage sizes tend to run smaller than modern day sizes. Additional measurements: Shoulder to end of sleeve is 22”. Armpit to end is sleeve is 16 3/4”. End of sleeve measures 7 1/4” from side to side. Shoulder to armpit is 9”. This could be worn by him or her (depending on your style). 1960s 'H BAR C CALIFORNIA RANCHWEAR' WESTERN SHIRT! IT HAD A LOOP COLLAR, THE LOOP IS TORN SO YOU CANNOT BUTTON THE VERY TOP BUTTON, IT'S HIDDEN BY THE BIB ANYWAY. WESTERN YOKE ON BACK. SIZE: 16 1/2, SLEEVE 34, ARMPIT TO ARMPIT 23 1/2". Very rare in this condition! It's in GREAT shape - no holes or stains. Only a slim guy could button this shirt up comfortably. 2 POCKETS! 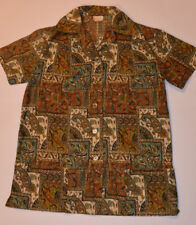 1960s JANTZEN CABANA SHIRT! GENUINE JANTZEN! PATTERN HAS PAISLEY, FLOWERS, LEAVES & MORE. SMALL VENT ON EACH SIDE. TWO HAND POCKETS. NICE SHAPE, NORMAL SIGNS OF USE & AGE. LIGHTWEIGHT FABRIC. Length (collar-to-hem) - 34”. Chest (pit-to-pit) - 25”. X-Men Shirt Vintage tshirt 1993 Collage All Over Print tee Off White Avengers. Shipped with USPS First Class Package. 'All cotton multi color red plaid flannel shirt in size 38! Waist- 19" across. Breast pocket and button up front /cuffs. Chest- 21" across. Length- 24". Short torso for tying up midriff style or tucking into high waist bottoms. BUTTON SLIDE POCKET LEFT-. 40" SLEEVES. 32" COLLAR TO HEM. CHEST(ONE SIDE): 21". LENGTH: 30". Carhartt Heavy Duty black Coat. Great fabric and print; button down front. Size XLarge. Made in Hong Kong. Clean inside and out.